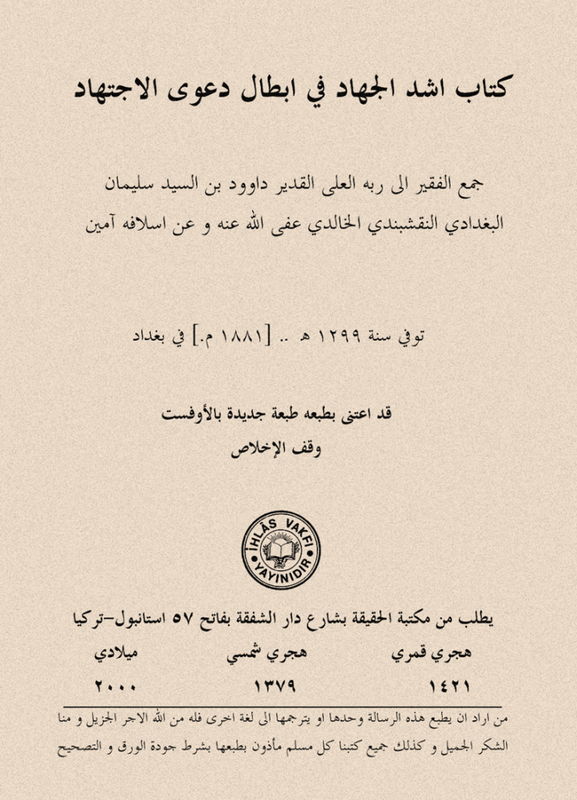 Figure 1A: One of the books of the Imam, entitled The Greatest Jihad in Negating the Claim to Absolute Ijtihad. The word Jurjis (pronounced jur-jees) is the second name of the great scholar Imam Dawud ibn Sulaiman Jurjis Al-`Iraqi (d. 1299 AH). Hailing from the region of Al-`Anah, an outskirt of Baghdad in Iraq, he was one of the great hadith, fiqh and creed teachers of the past age. I thought it would be fitting to have his name here to honour history and get reward by mentioning one of the saints of Allah. We deserve to see a good glimpse of the scholarship of yesterday. His full name is Dawud ibn Sulaiman ibn Jurjis al-Musawi Al-`Ani Al-Baghdadi An-Naqshabandi Al-Hanbali. He was born in Baghdad in Iraq in the year 1231 AH (AD 1816) from a family of scholars that were the chief judges and high ranking scholars of the 13th century Hijrah. Imam Dawud began his early education with his father, Imam Sulaiman Al-Musawi al-Hanbali, who was a calm and pious man, known for his wisdom and careful preaching. The young boy Dawud learned with his father until he excelled in his studies. He would divide his time in the day as waking hours from sunset until after Fajr prayer. In the night, he did most of his worship, review of materials he had memorised, as well as the recitation, praises of Allah and supplications from the first three generations that he would utilise just after the Fajr prayer. Between Zuhr and `Asr or a few hours before, he would sleep to rejuvenate himself. He continued on in this pattern and was only interrupted by the shocking death of his father, which had a major impact on him. After he recovered from the loss of his father, the Imam left Baghdad so he could set out to other locations, collecting what would later become his 3,000 volumes of precious books and rare manuscripts that he used for deciding rulings. At one point he became an emigrant for the sake of Allah and His Messenger, peace and blessings of Allah be upon him, and made his way to the Holy Land of Makkah and Madinah and was resident therein for ten years. As a student there, he took knowledge from Imams such as Muhammad `Abid Al-Ansari, who at one point gave him written authorisation to teach all the sciences of the religion as an authority. After this time in the Holy Land, Imam Al-`Ani returned to Baghdad and was teaching in the Jami` ul-Wazir Masjid but was soon back in the Holy Land for Hajj the following year and again in the company of many scholars. Sham was the next stop for him and he remained there for the best part of two years or more, taking knowledge and taking and giving authorisation in numerous sciences of the religion. During this time, Damascus in particular and Sham (Syria, Jordan, Lebanon, Palestine, Israel) in general had such greats as Imams Badr ud-Din al-Hasani (d. 1354 AH/AD 1935), Hasan ash-Shatti, (d. 1274 AH/AD 1858) `Isa al-Qaddumi (c. 1188 AH/ AD 1774) and his clan, the Al-Hanbali family of Nablus, `Abdul Ghani Al-Lubadi (d. 1319 AH/AD 1901), Muhammad ibn `Uthman ad-Dumi (d. 1308 AH/AD 1891) and so many others that were either visiting scholars/students or teaching and/or learning full time and residing. Soon the Imam would find himself back in Iraq in the city of Mosul for 5 years, teaching and training scholars from there and expatriates from Az-Zubair and Ba`qubah. Baghdad once more became his home when he went back and he did not stay long before heading out for the Holy Land one more time, but this time he had the company of his son, a scholar in his own right in the year 1281 AH (AD 1864), by the name of Muhammad Rashid Baha’ ud-Din. This would be the last time he would go on Hajj and his last journey outside of Iraq as he intended to go into teaching full time upon return. Imam Dawud Al-`Ani, after Hajj, visited Egypt and stayed for two years and went back to the land of his birth, stopping first in Mosul and staying some of the time there but preferring to shuttle back and forth to Baghdad. The life pursuit of the Imam was to live knowledge, give advice, guide people, help guide the lost, establish on truth those on falsehood and rectify the good, which was in part preaching to Christians and also calling 12er Shi`ah out of their cult and into a real and lasting relationship with their Lord and acceptance of true scholarship. He came back to Baghdad in 1299 AH to author more texts and discuss matters with scholars in detail about the recent appearance of the Salafi cult (which during that time was masquerading under the name of “Al-Muwahhidun,” lit. “Those who truly declare Allah Unique and One”). He had already shown the transparent and dead theology of two missionaries in the organisation: `Abdur-Rahman ibn Hasan Al Ash-Shaykh and `Abdullah bin Abi Butain, who at one point had to be commanded by `Abdur-Rahman ibn Hasan not to correspond any more with the Qadi as he was now entertaining doubts (this can be seen in the introduction by the former in the beginning chapter of Tuhfat ul-Jalis Fi Radd `Ala Dawud ibn Jurjis). 1) Al-Minhat ul-Wahbiyyah Fi Radd il-Wahhabiyyah, a work that touched on his initial meeting with their documentation and missionaries and the danger they posed to Islam and Muslims. 2) Ashadd ul-Jihad Fi Ibtali Da`wal Ijtihad, which was a text rejecting the claim that no one is obliged to follow the interpretative discipline of the first three generations that we know in the madhhabs. A lengthy elucidation is offered in its’ pages on the difference between a real high ranking scholar and pretenders. It is most likely this work that triggered the assassination attempt by Al-Muwahhidun group and as many as four books they authored to try to dampen the doubts he had raised. The death of the Imam came on Monday 30 Ramadan 1299 AH (AD 1881) during the governorship of Taqi ud-Din Basha. His burial was witnessed by a huge amount of people and on at the time of his bathing, those preparing him were weeping. Once wrapped in his burial shroud but before burial, many wanted to take one last look at the man himself. He was eulogised locally and much reading of the Qur’an was done and dedicated to him. His final resting place was next to one of his teachers, Imam Siraj ud-Din Musa al-Jaburi and `Abdul Ghafur Al-Mushahadi an-Naqshabandi, inside the corridor of Masjid Nafisah at-Tahirah, but in 1366 AH/AD 1946, for reasons unexplained, his remains were moved to the graveyard where Imam Ma`ruf al-Karkhi was buried. It would be only months after his burial that Iraq was attacked and ransacked by Muwahhidun hordes that only a year ago had tried to assassinate him and had killed scholars locally. His students included Imams and Judges of calibre like his two sons, Muhammad Rashid, Ahmad ibn Dawud and close friends like `Abdul Wahhab an-Na’ib, `Abdur-Rahman an-Naqib, Hasan ash-Shatti and a host of others. The most famous of these students were Imam Hasan ash-Shatti, who authored several books on creed, grammar and fiqh, as well as his son Ahmad ibn Dawud Al-`Ani. Imam Ahmad (1286-1367 AH/AD 1869-1948) was an able pupil, a teacher of Ihsan, teacher and judge in Ba`qubah and part of the underground network of believers fighting against nascent Socialism that would later become Ba’athism (founded by a Christian, Mishal Aflaq), Consolidation Forces in Iraq after the collapse of Muslim governance in 1336 AH (AD 1919) and Al-Muwahhidun. He wrote extensively and attempted to manage affairs for the believers as a Qadi but was hunted without success by Consolidation Forces (names of Qadis and high ranking scholars in the Muslim world were distributed to CF to be killed, as many as 5,000 died throughout these areas following the collapse of Muslim governance. Many of the remnants were assassinated by Al-Muwahhidun members). We ask Allah that He bless us, have mercy on us and give us the fortitude to be steadfast as these men of yesterday. May Allah Most High reward and bless the Imam and all the great scholars mentioned here. Thank you for sharing this with us and may Allah reward and bless you aameen. I had contacted you previously about getting your permission for posting a note from the book you translated, ‘The Divine Lighting’. You approved it, and I have posted it for the people’s benefit. I have been reviewing ‘The Divine Texts’, and there are a couple of footnotes there that I would also like to share with our group on Facebook, Masjid Quba School Camden, NJ, in particular, note #244 which speaks of tasawwuf. So I am seeking your permission again insha’allaah.